Round neck leopard print coat from Zara. Made in Spain. In excellent condition has removeable faux fur collar. 100% leather. DKNY JEANS Faux Fur Leopard Coat Swing Print Party Coat Womens M 8. Shipped with USPS Priority Mail. 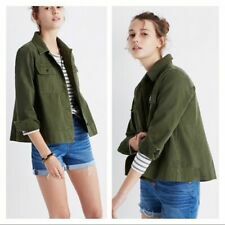 Madewell Northward Cropped Army Jacket Green New S $128. Shipped with USPS Priority Mail Padded Flat Rate Envelope. It features black boiled wool with beautiful draping, a latch at the shoulder, and lined sleeves. 100% wool. Arms lined in 100% polyester. 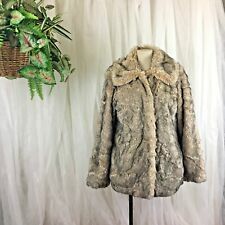 Gorgeous real fur vintage coat with drawstring waist. I am not a fur expert and can't determine the type of fur, however 100% positive it is real fur. Excellent vintage condition aside from a few flaws. Please see photo 7 and 8. No label. No size. Measurements are as follows. ( taken laid flat) Shoulder to shoulder (back)-16" Armpit to armpit (back) -20" Armpit to armpit (front) - Sleeve ( from top of arm to bottom) -19" Waist- 18" Total length (from back of collar to bottom)- 25" * I usually do not accept returns, however if any issues arise please contact me and we can solve. Fully Lined. Sleeve: 19". Color: Blue. Length: 20.5". Size: L/XL. Excellent condition. Cotton blend stretch denim. Open front, collarless neckline. Long sleeve, waist length. 46" chest, 24" long, 17" underarm to cuff. Misses Spring Caslon Jacket. -This jacket features a ruffle at the bottom and an unfinished edge at the shoulders, around the neck and around the bottom. Dress it up or down. -100% Cotton. Damaged Vintage Brown MInk Fur Jacket, has rip in back and on sleeve. Comes from a smoke free home. No size tag but fits like a M - I wear size 8–10 in dresses and coats. 7.Modifier Red Scallop Edge Wool Coat Double Breasted M. Condition is Pre-owned. Shipped with USPS Priority Mail. Inventory: E4. Other info: Full Zipper; Ruffle Detail. (~~~ NEW LA BLEND REVERSIBLE SOFT SHELL CAR COAT SPRING JACKET. BLACK & WHITE REVERSIBLE TO WHITE & BLACK :0). Woman's Size 3X Winter Coat. Condition is Pre-owned. Shipped with USPS Priority Mail Large Flat Rate Box. Alberto Makali Faux Fur Peplum Coat - Size S, chocolate brown with “distressed” look on face and cut faux fur interior. Princess seams on front and back for flattering contour and double ruffle at hem, neckline, front closure, and trumpet sleeve makes this a very fun and festive coat. Two discrete hook and eye closures at center front. Condition is excellent pre-owned with no tears or stains from a smoke free home. Shipped with USPS Priority Mail. Woman's boiled wool (felt) coat, red, XL, handmade, pre-loved, great condition, roomy. The design around the arms is very generous so you can wear a thicker sweater underneath. The color is so fun! Crystal fox fur coat. Lars Pausitian, Germany, Premium Furrier, Kiel Germany We're doing a Marie Kondo and iur loss is your gain. Bought in Germany for 1200 Euros Priced for quick sale. Condition is Pre-owned, lightly used, excellent condition. Shipped with USPS Priority Mail. US/Canada deliveries only. Canadian deliveries priced accordingly Size Women's Large Length with collar. 35.4 inches From shoulder 32.7 inches Shoulder width 17.3 inches Sleeve length from shoulder 24.8 inches Chest closed 44.88 inches Hem width 54.33 inches Lowest price. BUY NOW! A chic black textured woven cotton mid length coat by the French label Maje. Style is Gretelle and it’s got a button closure in front, braided leather accent at collar, two front patch pockets. Fully lined in cotton fabric. A lovely coat to wear over a dress for a wedding or night out. In excellent preowned condition, no signs of wear, lining is pristine. Size 40 French which is about a US 6-8, true to size in Maje. Measures 40” bust, 15.5” shoulder seam to seam and coat is 30” long. The color is stunning. A gorgeous deep turquoise. DO NOT pass this jacket up. Belted jacket with a belt. 3% Spandex. This is a pre-owned item and as such, does show signs of wear. There is a small tear in the lining near the left shoulder and several small holes as can be expected with a wool item. The last picture is an up close and it has the most accurate representation of the color of the coat. Reformation Templeton Coat, Size Small. Condition is New with tags. Shipped with USPS Priority Mail. CB Wraps By Canvasbacks Wool Jacket Size S Gray Coat Pop Rock 1980’s Art Wear. Beautiful 87% wool coat- fantastic condition.... beautiful gray color... curly wool on trim...great art Applique...very 1980’s!! Condition is Pre-owned. Measures : 25.5” pit to pit 22” between shoulder seams sleeves 20.5” long length is approximately 49” Shipped with USPS Priority Mail. Beyond Threads Reversible Alpaca Blend Coat. Felted rich and lightweight alpaca blend. 75% alpaca, 15% wool, 10% nylon. 20" from armpit to armpit, 30" length. Sleeves have a deep cuff. Woman's Heavily Embroidered 100% Linen Coat / Jacket. 100% Linen ( heavy). 23" armpit to armpit. 19" Sleeve. Size 2 (Large ). 18" Shoulder to shoulder. 35" Length ( Nape to hem). The item is always better than the picture. IC Collection By Connie K White sz S textured 1 Button Closure Jacket. Condition is Pre-owned. Shipped with USPS Priority Mail. SLEEVE LENGTH 23" SHOULDER - 5". FROM COLLAR DOWN IN THE BACK 29.5". This Fabulous Jacket has a 100% cotton leopard print material, 7 buttons to close, 3 button on each sleeve cuff, 2 pockets on the outside, no lining. Like new condition. Fabric: 100% linen. Shoulder to hem: 33" at longest point. Size: Large. Fold Over Cowl Style Collar. 56% acrylic, 24% wool,28% polyester. Hand or Machine Washable. Mint condition Oversized Size 00 but fits xs/s Bust- 36” Shoulders- 16” across Length- 31” Hooke And eye closure type up the front 2 front pockets Amazing! Coat knee length. Beautifully sporty and dressy! Black leather and suede with cranberry and pink embossed /brocade design ( I think?. not sure how to describe. Silky like lining. Excellent condition. ). EMMELLE Women's Jacket Black XL NWT! It’s 1956 and chilly in Chicago. It’s beautiful. There is a hole in the lining as pictured but overall in excellent shape. Matilda Jane Jacket, Large. Condition is Pre-owned. Shipped with USPS Priority Mail. Perfect spring jacket! Looks Good With Jeans Or Black Leggings. Gorgeous pink and brown tweed coat. Says medium but would be a women’s small. In excellent condition! Beautiful Silver Gray with protection from Rain, Sun and Wind.